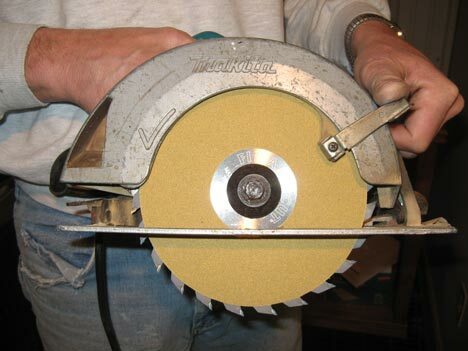 Way back in August of 2008 I reviewed the Final Cut Saw Blade with Sanding Disks. Final Cut, if you do not remember, is a blade that uses specially made sanding disks that are attached to its sides. These disks do the unique task of sanding your material at the same time it is being cut, thus saving you a step in your building process. These disks offer a much smoother cut while cutting in just about any application, and I also noticed a few other advantages while using the disks during my previous testing. Final Cut has just announced that they are now offering their products in the 7-1/4” size. Now anyone that is using a standard 7-1/4” circular saw can take advantage of what the Final Cut has to offer. The 7-1/4” blades use the same technology as their larger brothers, so if you have had success with one size, you are likely to have the same success with any size. Final Cut blades are specifically designed to work with the sanding disks, and have a kerf that is slightly smaller then the blade width when the sanding disks are attached. This step up in width is what allows the sanding disks to do their final sanding. So while you can use the sanding disks on other manufactured saw blades, it is always recommended that you use one of the Final Cut blades if you can. The 7-1/4” Final Cut costs $19.95 and replacement sanding disks are also available.